Banh Pate So (pate chaud- hot pie) was a common treat my mom made while growing up in Michigan. I remember my mom making dozens for my sisters and I to eat before we left for school and afterwards as snacks before she got home from work. Although not as well known as the banh mi, the other popular French influenced dish, banh pate so is often found at the same delis that sell banh mi. You can use any meat, but we like pork or chicken. You can put as much or as little additional fillings as you like as well. My mom typically made it with plenty of diced onions, but we wanted to clean out our pantry and added some woodear mushrooms and bean thread noodles and chopped celery. My mom made it with puff pastry cups but since puff pastry squares was all that we had, it’s more than an adequate substitute. We even made extra which kept really well in the freezer. Just thaw and bake. You never think it was previously frozen. Allow the puff pastry to defrost in the fridge and preheat oven to 400 degrees. Combine the meat with onions, fish sauce, ground pepper and any veggies you plan to use. Add the meat mixture to one corner. Be careful not to add too much and leave space at the edges to seal the pastry. Brush the edges of the pastry with egg wash and fold it into a triangle. Crimple the edges with a fork to seal. Brush the top of the pastry with egg wash for a beautiful golden color. Finally, poke a tiny slit at the top to allow steam to release and allow the puff pastry to rise. Bake for about 15 minutes or until golden brown. It was my turn to make banh pate chaud for my niece and nephew as they visited me here from California recently. 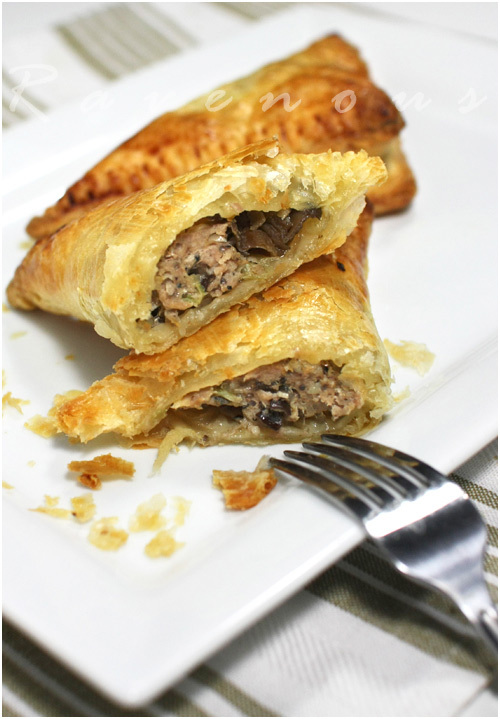 They loved it and had no problems eating the veggies when packaged in the crispy and flaky pastry. It’s so easy and great to store in the freezer for a quick and easy snack. My mama makes these for breakfast every time I come home to visit. Delish! I agree w/Cathy,these are delicious to the fullest! Thanks for posting! I usually get one (or two… or three) of these whenever I see a banh mi shop that sells 'em! this reminds me so much of of empanadas. These remind me of our curry puffs and samosas. Baked to a lovely, golden brown. Wow, perfect!! This looks like quite a treat! Anything wrapped in puff pastry is good in my eyes! cathy: vietnamese don't have many options for breakfast, but pate chaud is one of the best! Jenn and Ju: pate chaud is similar to empanadas and samosas! FLB: We couldn't agree with you more! I echo what someone else said — these make me fondly remember my childhood days of eating Chinese curry chicken turnovers from Chinatown bakeries. I love your rendition of this, especially the creative "use what you have'' filling. This looks so yummy. I think I read that you guys lived in Michigan before? Did you guys ever come to Chicago? I just moved to Chicago recently and was wondering if you remember any good eateries for Vietnamese food out here. Would love any suggestions, if you have any. These are just beautiful. I could taste the butter from the pastry combined with the lovely filling. These looks very delicious. They remind me of the sardine puffs back home….really delicious. Yummy!! I love your filling! I didn't realize there was a Vietnamese puff of sorts and will definitely look around more carefully next time I'm buying Banh Mi. It kind of reminds me of Chinese curry puffs, which I love!! I love puff pastry and what a delicious filing! Can't wait to try these! These are very yummy, but so expensive to buy. I think it cost $1.25 here. Cost alot cheaper if you make it yourself. My question about freezing. Do you freeze them after you bake them? or wait til you want some and put in the oven? This is awesome! 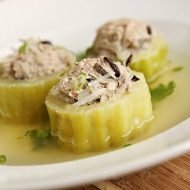 I have been looking for a recipe for Banh Pate So in a while. Thanks for posting this! 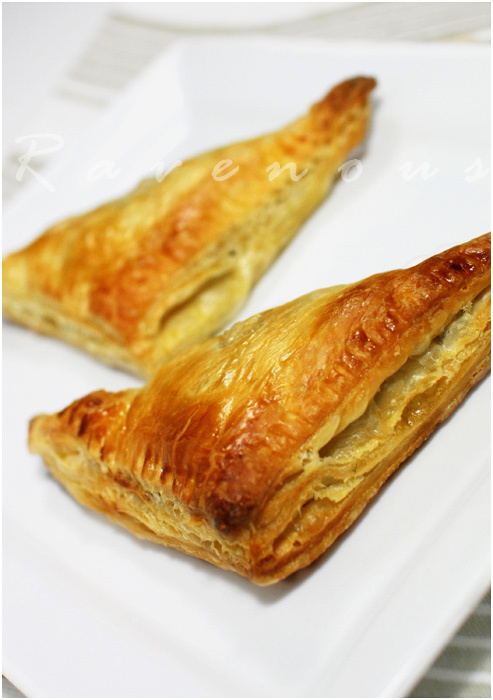 Oh wow those looks SOOO good, flaky and perfect for snacking on! My mom used to make something very similar to this growing up. Lovely puffs. Care to share one? I've made these a while ago. They were the bite size version and they were gone in less than 10 minutes. Your post is a reminder to make some more soon. What's Cooking at Soomeenshee's: Unfortunately it's been a really long time since we've been to Chicago. There is a chinatown/vietnamese town that you should probably check out. Sweetmango: We make the pate chaud and freeze it before baking. After thawing, about 4 hrs or so, just bake. You can't tell it's previously frozen. My: let us know if you make it and how it goes! I could eat this for breakfast, lunch AND dinner. Yum, thanks for sharing this. I'm going to try the recipe out soon. Wow~ I like this pie. The pastry is so flaky and the filling sounds very nice. ooh, i love pate so! i love a great filling. i'm going to have to use this recipe and try it myself and surprise my parents with it! yum yum. Holy smokes. This looks like one of those totally addictive foods to eat. What a fabulous thing to grow up with! Just a question, about how thick was the puff pastry dough? I have some in my freezer, but it usually needs to be rolled out slightly first before use. I can't stop looking at the photos, I may make this over the weekend! veeda: let us know how it goes for you and if you can, post it on your lovely blog! connie: we just use the store bought puff pastry squares. ours was no more than 1/4 inch thick, maybe even less. i could devour 4 of these instantly…oops there goes my low carb diet hahah… but it's going to be worth breaking the diet don't you think? hahaha! Lovely meat pies. I love meat pies for breakfast. Can't have it too often though. These little pastries are so cute, my mom used to make them for me as a kid. these look really deicious and easy to make! 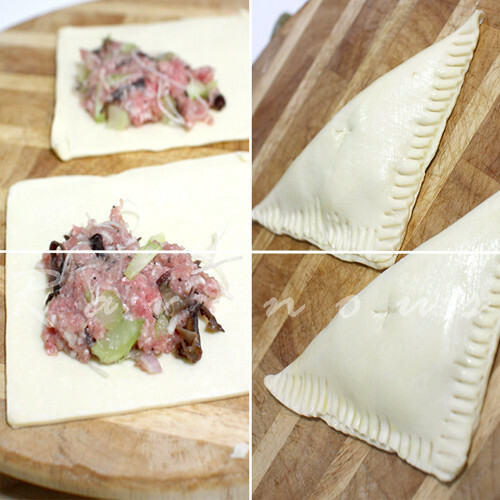 My hubbs loves hot pastry goods and as he's vietnamese – I'll make him these for his breakfast! Love that you were able to take a modern spin on a recipe that brings back so many memories. That frozen puff pastry sure does come in handy! My mother in law makes these quite frequently and I have to exercise complete restraint or they'd be gone in minutes. Thanks for stopping by! Malou: oh, just a bit of buttery puff pastry can't be that bad!! Patty: It seems most Vietnamese have great memories of pate so. Plumleaf: Let us know how pate chaud goes! Debi: Agreed. We always keep it in stock now. Matador: Pate So is hard to resist aren't they? Oh my- that just asks to be eaten. It looks so good. I love the angles in your photography. Meat pies are old English favorites. Great anytime. The Filipinos have empanadas. This looks similar! Hey guys! I've been given instruction to make the appetizer for Mother's Day and I dunno how this came about, but I'm totally making this! I've never made Viet food before, so it should be interesting, haha. I was just posting about pate so and googled to see if I had it spelt correctly and came across your post… didn't know that it could be spelt pate chaud… but makes sense. And had no idea how to make pate so. Thanks for the info… here's my post, if you're interested. My sister and I made these today. We ground our own chicken using my Kitchen Aid mixer food grinder attachment. We did onions, chicken, bean threads, wood ear mushrooms, carrots, and celery. They were very tasty…we made 6 pies per pastry sheet, so 12 pies per package (Pepperidge Farm). We baked them for 20 minutes….since they were a little bigger. They were delicious and a hit with my American in-laws! Oh I love pâté chaud! My mum used to make these for me when I was a child and I don't think I've had them in many, many years. 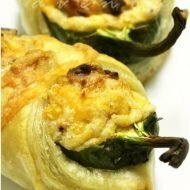 I just made these for lunch today and they were just delicious! 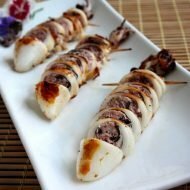 You have such a great blog and I love that you are sharing your Vietnamese recipes, especially the dishes which you would never find in restaurants. I think it's a great way to keep the Vietnamese food traditions alive, particularly since our parents were never in the habit of writing down recipes; everything was always cooked from memory. Keep up the great work! Inspired by your recipe, I posted my own recipe of Banh Pate So on my blog. I put a link to yours as well so people can compare the similarities and differences :-). Thanks for sharing! Where can I find the pastry dough? What is the name, how does it loo? If it's possible, can someone please post a pic of the pastry box from the store so I know what to look for? this bring back memories of visiting banh mi shops in northern california, i grew up on pate so it makes me fill like a child again when my mom would make these for us. it makes me proud to be vietnamese when i see great food like this. Googled pate chaud recipes cause I brought home from Lee’s sandwiches and wanted to make it- it turned out perfectly, thanks so much! Thanks so much for this recipe!! By far one of the best PateSo recipes out there. I’ve made this several times for parties and gotten so many great comments on them. Where could i find puff pastries cups/squares? I am looking for purchase the pâté chaud skin in Seattle (WA)? Please let me know. These look fantastic, and I’m hoping to sell them with pho at a function that I have coming up. I was wondering if I could bake them, let them cool, then bake them again to reheat and serve. Would that be the best way for a quick turnaround? Thanks so much, I’m excited! yes, you can try to par bake…but we’ve had success baking straight from the freezer!